Spin a lot. Then spin some more! Like death and taxes, the eternal revolutions of Sonic are a true constant in this world. Largely unchanged since its original appearance two decades ago, Sonic's bumper-bouncing, crazy-spinning, coin-collecting antics are still driving the development of new platform titles. This year's E3 gave us the chance to see Sonic Colors, the new game from Takashi Izuka. 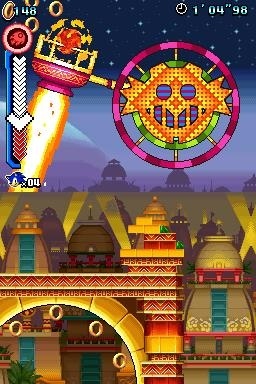 The gimmick this time around is that Sonic will collect powers associated with different colors. You see, Eggman has collected various planetoids and tied them together into a sort of incredible interstellar amusement park. The problem is that he hasn't bothered to consider the feelings of the multi-colored Wisps, the inhabitants of these kidnapped worlds. Now Sonic, out of the apparent goodness of his heart, has decided to help the Wisps. The game uses all the Sonic moves you've already mastered in Sonic Unleashed, from boosts to homing attacks. This time around, you can absorb the power of Wisps to unleash powerful laser attacks or drill through the ground beneath you. It's possible to play the game without these powers (and you'll even have to complete certain portions of the game before you can gain access to certain powers), but the idea is to give players a reason to come back and replay levels using the new powers to explore previously inaccessible areas. We saw two areas: a tropical world where Sonic had to fight a giant Ferris Wheel monster, and a bizarre candy factory where he had to fight, I don't know ... diabetes. The basic gameplay is built around the Sonic principles of racing around ramps and loops collecting coins and avoiding obstacles and enemies. It was nice to see the camera switch freely from a traditional side-scrolling perspective and a behind-the-character perspective. Sonic Colors is due out for the holidays and will be coming in two different versions, one for the Wii and one for the DS, with unique levels and powers for each.